After a long struggle with dental disease, you have finally lost the last of your remaining teeth.Â Like over a quarter of Americans in their 60s and 70s, this unfortunate development can have a profound impact on your health and self-image. While there are a number of advanced methods for replacing lost teeth, there's one tried and true option that's centuries old — the removable denture. It's the option millions of people have chosen to lessen the impact of missing teeth. Fashioned properly, removable dentures restore the form and function you once had with your natural teeth. The prosthetic (false) teeth are precisely placed in an acrylic, gum-colored base that closely follows the contours of your gums. Because they're removable, they're fairly easy to clean and maintain. They do have a disadvantage, though, and it's related to bone health after tooth loss. Like other living tissues, bone has a life cycle: as older cells die, new cells form to take their place. The forces your teeth generate when you chew stimulate new bone growth. But without teeth to provide this stimulation, new bone won't keep up the pace of replacement at a healthy rate. As a result you may gradually lose bone, as much as a quarter of its normal width within a year of losing a tooth. Dentures don't transmit any stimulation to the gum and bone from chewing. Furthermore, the compressive forces transmitted to the gum and underlying bone tissue contributes to bone loss. 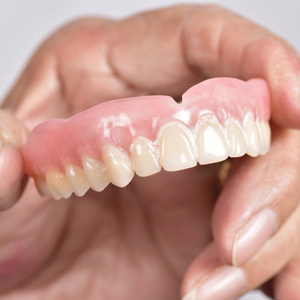 As the bone continues to diminish, your denture fit becomes looser to the point you will eventually need them relined with new acrylic material or have a new set made. There is another alternative when patients loose all of their teeth: an implant-supported removable denture. Dental implants can be used to keep the dentures more secure and can also slow or even halt bone loss where the implants are placed. In this case we strategically place a few implants to serve as supports for a removable denture. The denture has connection points that join up with the implants to hold it more securely in place. As few as two implants are needed in the lower jaw, while the upper jaw does better with three or four implants. Losing all your teeth can be traumatic, but there are effective ways to overcome it. With new technology, the traditional restoration of removable dentures may be the vehicle for achieving that.